The Packers’ defense came out extremely shaky in the first half. However, when the team became desperate for stops late in the game, they came through in the clutch to get the ball back into Aaron Rodgers’ hands. No play more important than when Kevin King was able to swivel around to claim a deep seam route intended for 49ers’ Marquise Goodwin that gave Rodgers the opportunity to capture the win. Green Bay also received an excellent performance from defensive interior Kenny Clark, who collected a handful of tackles, one sack and one hit while wreaking havoc during each snap on the field. Clark was able to bull-rush his way to pressure multiple times during blocks by center Weston Richburg and had a hand on several run stops during the second half. Would you be shocked if we told you Rodgers completed just 54.4% of his passes? It shocked us too, as it appeared as if Rodgers could do no wrong. The final two drives of the game will mask any struggles the team had in the third quarter and into the fourth before he took over this game with another thrilling come-from-behind victory. The final two drives were littered with big-time throws, providing another instant classic. Davante Adams was excellent as Rodgers’ primary target, but the play of rookie wide receiver Marquez Valdes-Scantling will get overlooked by most. On five targets, Valdes-Scantling caught three for 103 yards. The fifth-round rookie out of South Florida is filling in for the injured Randall Cobb nicely so far. 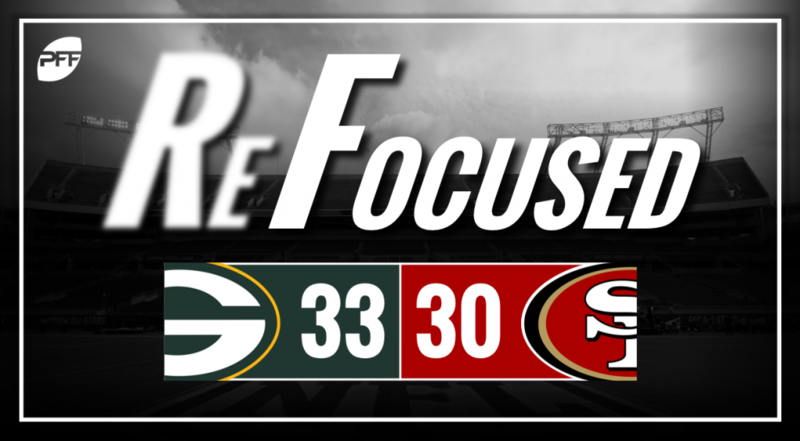 Powered on the legs of running backs Matt Breida and Raheem Mostert, the outside zone rushing attack of the 49ers paid dividends for their offense in Lambeau Field on Monday Night Football. Following a 22-yard reception by wide receiver Kendrick Bourne, Breida made a nice spin move away from Dean Lowry to find the end zone for their first points. Mostert also provided an excellent change-of-pace to pace the team with 87 rushing yards. Coming into the season, it was expected that Goodwin would emerge as the go-to option for San Francisco. Due to injuries of his own and to his teammates, that prediction had yet to materialize until tonight. Goodwin took advantage of the coverage from Kentrell Brice on a skinny post to score from 33 yards out to close out the first quarter. Two possessions later, he connected with C.J. Beathard again on a post-corner route, fooling Tramon Williams down the left sideline for a 30-yard strike. Veteran cornerback Richard Sherman again was avoided for most of the night, allowing just one catch for 10 yards. Coming into the game, Sherman sported some eye-popping stats, as he allowed just one reception every 146 coverage snaps and a minuscule 0.12 yards per cover snap through Week 5. These numbers are unlikely to hold up over the course of the season, but he’s been the definition of a shutdown corner in 2018. DeForest Buckner continues to be a menace up front. He recorded a sack, had several pressures and another sack nullified by penalty. Unfortunately for the rest of the 49ers’ defensive line, not much else worked, as the Packers’ front five held steady outside left guard Lane Taylor. Rodgers did it again with two fourth-quarter drives to tie and then win the game. It was a rather lackluster day until he seemingly took it to a new level when it mattered most. A promising start to the game for the 49ers’ offensive attack ended with glaring struggles during the second half.